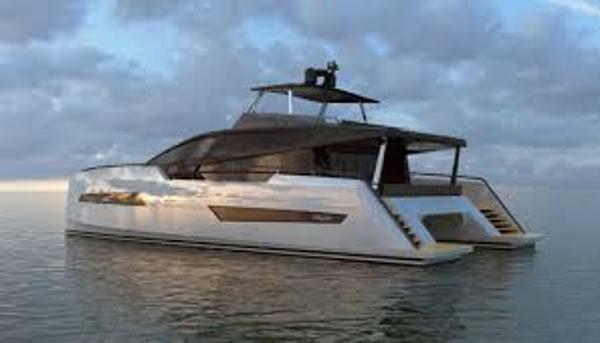 2016 Privilege Furio 6 2015 pricing still available... Now take advantage of the strong dollar Introducing Privilège Furio 6….a modern era 64' Power Catamaran based on strong character. Famous naval architect Marc Lombard and his design office, the ML Design Team have reached the incredible… Style, `Range`, Performance and Safety! Naval Architect Marc Lombard quotes: “Our desire is to offer a real alternative in the motor-yacht catamaran market. Some traditional trawlers reached the market recently but nothing really different. It was essential to bring a new point of view on the concept and the cruising program. Aesthetically speaking, her modern and distinctive shape is especially based on the Motor Yacht spirit rather than on sailing catamarans adapted to power….” Style….Power and refinement on two hulls will suit: -- Those who dream about stability at anchor and about comfort in rough seas, - Those who demand the space of larger yachts with personal customization, - Those who imagine having both, Privilege elegance and reliability. Range and Performance….Two versions Sport Version - cruise over 27 knots. Cruise Version -cross oceans and still capable of 20 knots. Safety…Bureau Veritas: your guarantee The global leader in Testing, Inspection and Certification. Privilege Marine is the only shipyard to have signed an agreement with BUREAU VERITAS based on regular visits and inspections. Every Privilege Furio 6 owner receives an individual certificate issued by BUREAU VERITAS Contact the exclusive North American Privilege Dealer for more information.